You can avoid the capital gains tax you would pay if you sold the stock. If you sold the stock, you would pay $1,400 in tax on the $7,000 gain. If you were also subject to the 3.8% NIIT, you would pay another $266 in NIIT. First, remember that the Tax Cuts and Jobs Act nearly doubled the standard deduction, to $12,000 for singles and married couples filing separately, $18,000 for heads of households, and $24,000 for married couples filing jointly. The charitable deduction will provide a tax benefit only if your total itemized deductions exceed your standard deduction. Because the standard deduction is so much higher, even if you have itemized deductions in the past, you might not benefit from doing so for 2018. Second, beware that donations of long-term capital gains property are subject to tighter deduction limits—30% of your adjusted gross income for gifts to public charities, 20% for gifts to non-operating private foundations (compared to 60% and 30%, respectively, for cash donations). 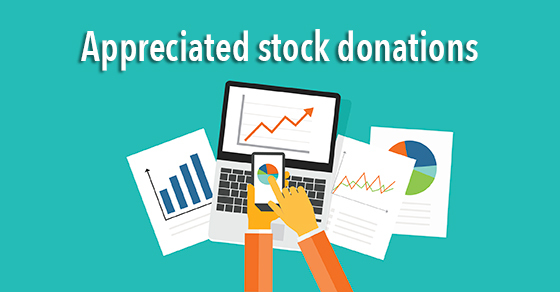 Finally, don’t donate stock that is worth less than your basis. Instead, sell the stock so you can deduct the loss and then donate the cash proceeds to charity. For charitably inclined taxpayers who own appreciated stock and who will have enough itemized deductions to benefit from itemizing on their 2018 tax returns, donating the stock to charity can be an excellent year-end tax planning strategy. This is especially true if the stock is highly appreciated and you would like to sell it but are worried about the tax liability. Please contact us with any questions you have about minimizing capital gains tax or maximizing charitable deductions.